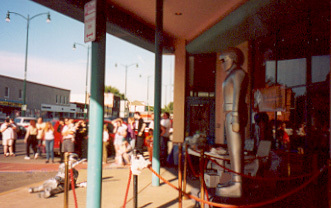 Re-enactment from the film THE DAY THE EARTH STOOD STILL with Klaatu and Gort in front of the Englewood Theatre. Dr. Benjamin Meade presents Forrest Ackerman, Bruce Crawford, and Billy Gray with an award from the mayor of the city for outstanding contributions to preserving film history. Bruce Crawford speaks to the audience about composer Bernard Herrmann and his brilliant score to the film. 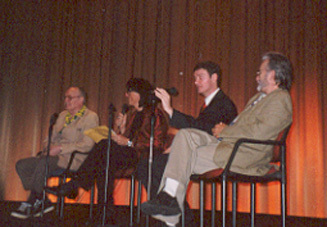 Dr. Meade takes questions from the audience for the panel about the making of THE DAY THE EARTH STOOD STILL. 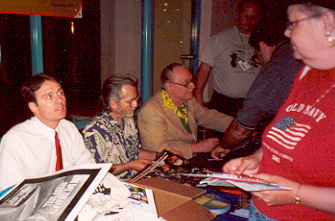 Bruce Crawford talks with moviegoers during the autograph session. Many fans of composer Herrmann from across the country were in attendance. 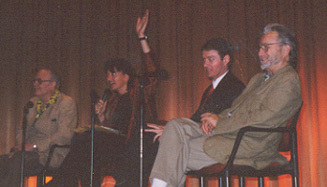 Dr. Meade and Bruce Crawford on stage for the showing of THE THING. 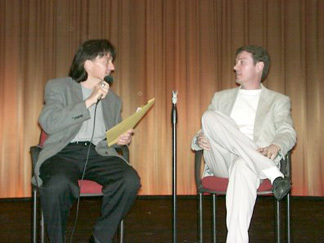 Bruce discussed composer Dimitri Tiomkin's score for the film. 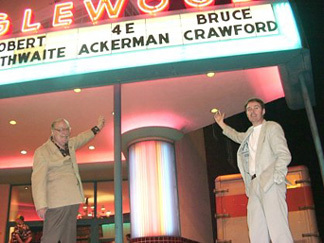 Forrest Ackerman and Bruce Crawford pose for the Theatre Marquee bearing their names.